The Rolo Badge from Smok is their latest Refillable Pod/Cartridge System. These systems are small All-in-One devices that fit into the palm of your hand for a discrete vaping experience. 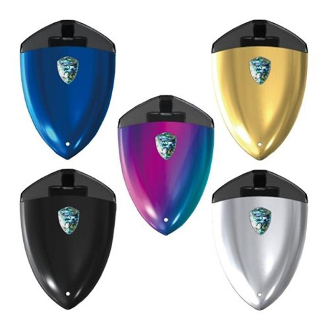 These pod systems have a classic automatic style with no button, simply inhale to enjoy the tasty vapor it produces. This kit has a handy magnetic cartridge design that makes this kit extremely easy to use and maintain. The pods have a 2ml e-liquid capacity. The Rolo Badge works best with Nic Salts liquids or liquids with high PG. You shouldn't use e-liquids with high VG as it is a thicker liquid and will gunk up the atomizer. The built in battery has a 250mah capacity had can be charged using the included designated charging cable and micro USB port found on the device. This device has an output wattage of 10-16W, an output voltage of 3.3 - 4.2V and a resistance of 1.2ohms. It also has an eight second cut off, short circuit protection and low voltage protection as well.